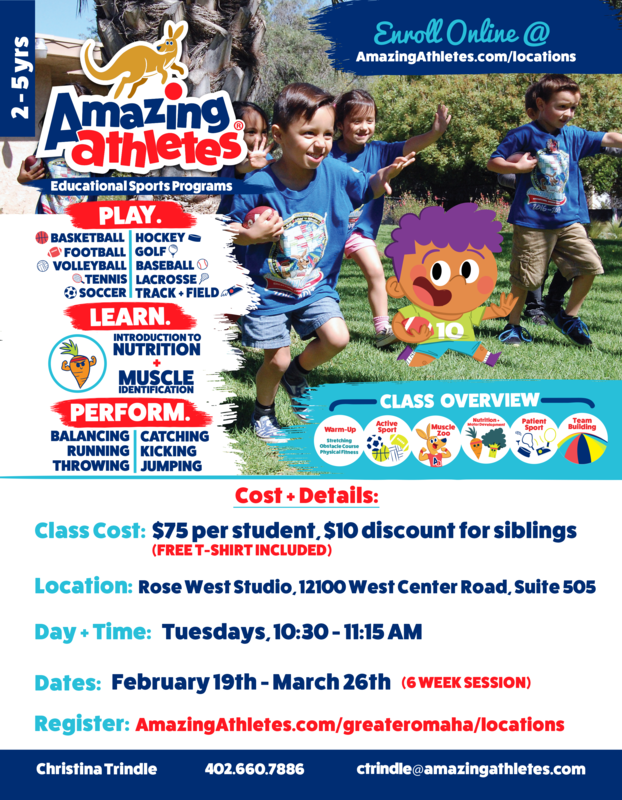 Amazing Athletes will be offering a new program for pre-K students at the Rose West Studio! Amazing Athletes is a “premier developmental physical fitness program empowering children aged 2 ½ to 6 years old to reach developmental milestones at an individual pace.” At this workshop, students will learn about nutrition and muscle identification, as well as sports and team building! The program runs for 6 weeks, beginning February 19th and ending March 26th. They meet on Tuesdays from 10:30-11:15 AM. Classes cost $75 per student, with a $10 discount for siblings– and there’s a free t-shirt included! Come have your kiddo learn about physical fitness and team building with Amazing Athletes! Register at AmazingAthletes.com/greateromaha/locations. If you have any questions, contact Christina Trindle at (402) 660-7886 or at ctridle@amazingathletes.com.